1 - Is the result guaranteed? 2 - How many moles are there on my land? 3 - According to which process will a mole catcher achieve its actions? 4 - What is the most suitable period to trap moles? 5 - What's the difference between a mole catcher using CHEMICAL GAS and a mole catcher using a traditional mechanical trap? 6 - What are the regulations about PH3 gas? 7 - What is the mole-rat? 8 - Why does the mole raise molehills? 9 - Why does the mole often appear in your yard suddenly? 10 - Do many gardeners complain about the growth of the moles' population? 11 - Are the various techniques used to fight against moles effective? 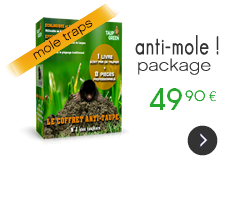 Taup'Green is the only mole catcher offering services that are guaranteed for several months. How many moles are there on my land? The density of the moles' population varies according to the composition and structure of the soil as well as to the surrounding area of your yard (location close to a forest, meadows…). Depending on the region where you live, there may be from 5 to 30 moles per hectare in your lawn. A mole can raise up to 30 molehills. According to which process will a mole catcher achieve its actions? The first action consists in a massive removal of moles (setting mole traps up to 100 per hectare). It usually requires two successive removal actions. What is the most suitable period to trap moles? As the mole (talpa) does not build up any fat reserves, it feeds continuously. Moles may be caught all year long as they do not hibernate. What's the difference between a mole catcher using CHEMICAL GAS and a mole catcher using a traditional mechanical trap? Be careful! PH3 gas trapping – hydrogen phosphide – is highly toxic and is classified under R40 (mutagen and carcinogen). This technique may be compared to grenade fishing! So what's the use of eradicating life in the soil (earthworms, microorganisms... and only part of the moles' population) whereas a small mechanical trap is effective and safe for children and animals! What are the regulations about PH3 gas? The mole catcher using PH3 gas must notify the prefecture services and prohibit access for a 48-hour period. This shall be done 48 hours before processing to the gas spray and signposts shall indicate “Highly toxic treatment” WHICH IS SELDOM THE CASE! BE VIGILANT! Even if the mole catcher, who uses gas, insists that he has to notify the prefecture services himself, you should not ignore the law (this notification must be mentioned on the estimate). Due to lack of flexibility in terms of gas use and for safety reasons (following the death of men and animals), local authorities have not been using the gas technique since the beginning of 2006 (see Press release). This gas is primarily restricted to agriculture today. It is forbidden in Germany and in Belgium more recently. It is the vole's common name which is a rodent contrary to the mole. Besides the vole feeds on roots only. Of a lazy nature, the vole often uses the mole's tunnels. Yet be assured that voles are locally present in Auvergne and in the south of France. There are no voles in Ile-de-France – the Paris region. Traditional trapping is also very effective to get rid of voles. Why does the mole raise molehills? The mole burrows tunnels, it spins an underground spider web and it moves all day long through the tunnels it has burrowed to eat earthworms. When a tunnel is burrowed, the mole evacuates the soil and this shapes a molehill. Why does the mole often appear in your yard suddenly? Do many gardeners complain about the growth of the moles' population? Many chemical products (insecticides) used in farming and in green spaces have been forbidden for several years. As a result, there are no longer microorganisms, your ground recovers its natural condition. Besides there are no longer earthworms and moles don't have anymore feeding. Such a situation leads accordingly to an increasing reproduction and a growth of the moles' population. A further factor that increases the number of moles is the lack of predators, with the exception of some good feral cats. Are the various techniques used to fight against moles effective? In France, the anti-mole market amounts to 10 million euros! So you will likely understand why manufacturers rival each other in inventiveness to launch new products on the market. The anti-mole products sold in stores are more and more complex; they are often dangerous for humans, pets and environment. Besides, no manufacturer has even tried to learn more about this animal, its way of life... There is still a majority of manufacturers who think that the mole is a hemophiliac animal feeding on roots! As a result, consumers buy an average of 2.5 products and if they want to eradicate moles or scare them away, the success rate is only 7% , a quite reassuring rate for moles' advocates. Traditional mole catching is the only effective technique and, as proof of this, this is the only technique used by professional mole catchers.